A small leper hospital was founded at Stourbridge, in the Barnwell area, sometime around 1125. At that time the hospital would have stood in outside the town walls, but now the site has been swallowed up by the expanding urban sprawl of modern Cambridge. The only remaining part of the leper hospital is the small, two cell chapel, which is probably the oldest building in Cambridge. The east wall dates from the original 12th-century chapel, but the remainder dates from a 13th-century rebuilding. Despite the rebuilding, the chapel retains many original Romanesque features. In 1199 King John granted the chapel the right to hold a three day annual fair to support its work with the lepers. The fair was generally held on Stourbridge Common, between the chapel and the River Cam. From this humble beginning, Stourbridge Fair grew to become the largest fair in all of Europe, and the post of priest to the Leper Chapel was one of the richest in the English church. It was also a meaningless job, as the hospital closed in 1279 and the inmates were moved to a new hospital at Ely. The Fair, however, continued to grow and prosper. In 1546 the crown appropriated the chapel and its property, leaving the University and town of Cambridge to fight over rights to the Fair. The town won, though the University was granted the right to control the quality of goods, and the weights and measures used. The chapel was used to store fair stalls from year to year and acted as an inn during the Fair. The chapel ceased holding services in 1751, and the fair was abolished in 1933. 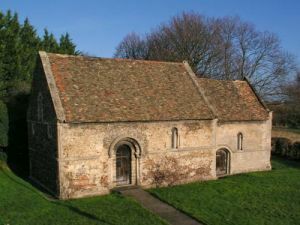 That might have been the end of the story, but in recent years the Fair has been resurrected on a modest scale by the Friends of the Leper Chapel, and the chapel has been restored under the auspices of the Cambridge Preservation Society. As mentioned, the chapel is extremely simple, composed of only a nave and chancel, and measures only about 50 feet long by 20 feet wide. The nave is of flint rubble in the nave and Barnack limestone in the chancel. There is lovely Romanesque decoration throughout, particularly around the south doorway, and the chancel arch, which features traditional Norman zigzag moulding. Location: At Barnwell Junction on the Newmarket Rd. Access on foot from Newmarket Road. Parking in nearby streets.